Glowing candles illuminate the darkening evening sky Wednesday night as a speaker addressed the crowd during a candlelight vigil in Belmont Shore held in honor of Japanese earthquake victims. 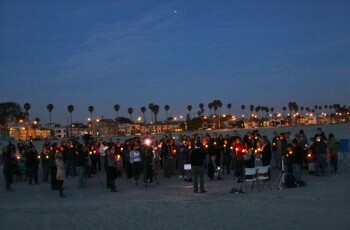 UPDATE Friday 4:32pm | About 100 community members gathered on a Belmont Shore beach this past Wednesday evening to honor the victims and survivors of the catastrophic earthquake and subsequent tsunami that battered Japan earlier this month. Organized by local activist Justin Rudd, attendees held glowing candles and tossed flowers into the ocean in a show of support for those who lost their lives and those whose lives have been turned upside down due to the pair of natural disasters in the island nation. A number of city officials, faith community leaders and local Japanese-Americans spoke to the crowd. Additionally, a collection was taken to raise funds that are being donated to organization providing aid to the ailing country as the aftermath of the 8.9 temblor and the damage it has caused continue to unfold. Scroll down to the end of the post to view additional photos. Monday 11:02pm | Long Beach residents are invited to participate in a candlelight vigil tomorrow evening at sunset for victims of the recent earthquake and subsequent tsunami in Japan. 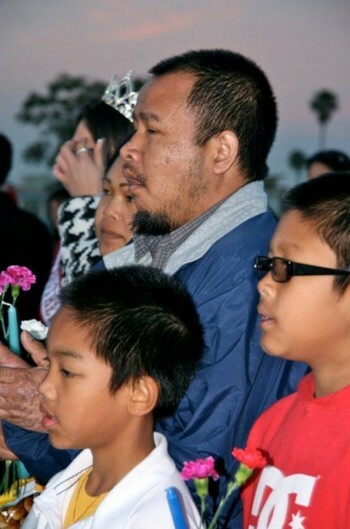 Organized by community activist Justin Rudd, the vigil will begin at about 7 p.m. at 1 Granada Ave. in Belmont Shore. Rudd said attendees are welcome to bring a single-stem flower to toss into the ocean, as well as a candle to light once the sun has set. All are urged to invite family and friends, he said. Slated to speak during the event are select Long Beach elected officials, leaders from the faith community and Japanese-Americans. Free parking will be available in an adjacent beachfront lot anytime after 6 p.m. The island nation of Japan was ravaged last Thursday night, when an 8.9 temblor actually shifted the country’s physical location by about eight degrees. It was not too long after that a tsunami caused by the quake swept over the recent ruins, all in all leaving thousands dead and many more injured and without a home. Rudd created and operates local nonprofit Community Action Team,. He is also the founder of Haute Dogs, a network of dog lovers from the greater Long Beach area. 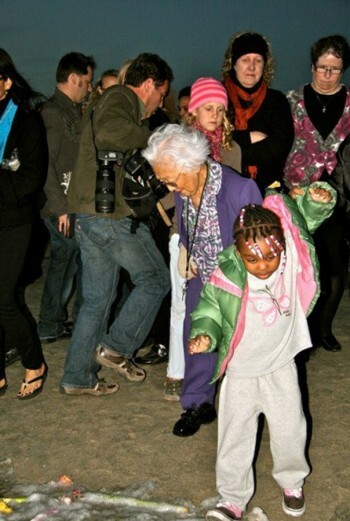 Residents young and old toss flowers into the surf during a candlelight vigil held in Belmont Shore Wednesday night in honor of the victims and survivors of the 8.9 earthquake and subsequent tsunami that ravaged Japan earlier this month. Community members hold flowers and candles as they listen to a speaker during a candlelight vigil Wednesday night in Belmont Shore held in honor of Japan’s earthquake victims and survivors. 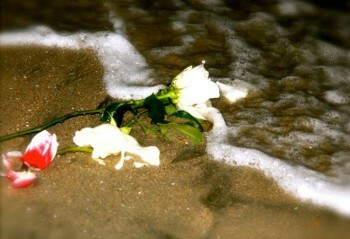 A trio of flowers tossed into the Pacific by vigil attendees lie at the water’s edge after the tide carried them back to the shore Wednesday night in Belmont Shore. The vigil was held in honor of the victims and survivor’s of the 8.9 earthquake and tsunami that ravaged Japan earlier this month.